Part 2: Dialing the dials. So you've been playing acoustic for a few years, but the worship leader has asked you to take up lead guitar to fill the need. Turns out it's harder than you thought. Part 2 of our 6 part series shines some light into the cavern that is setting your tone. Here are a few tips on setting your settings. If you've been taking lessons from Worship Artistry for awhile, you'll notice that our tone chapters have evolved quite a bit. Initially, I only offered really general descriptions and kept my tone pretty basic. You made it clear you wanted more than that and I must say it's been really fun diving into more specific effects. Still, the fact remains that if you aren't sure what to do, it's best to learn to just play the parts really well. A little overdrive and some unobtrusive delay will get the job done nearly everytime. What sounds great in your bedroom may not sound great from a stage. The sound system you play through, the physical structure of the room and the mix of the band all affect the way you sound. You may need to mess with the eq, add some overdrive or dial back your volume to get something that works with everyone else. Don't get frustrated or defensive. Just be willing to make adjustments. "Extreme" may have been the adjective of choice for every youth pastor in the 90's, but it shouldn't be a description of your guitar effects. The best effects alter your tone in a way that makes the part stand out more, not distract from it. Just because that dial goes to 10 o'clock doesn't mean it should live there. You can obsess over your tone forever, but what defines the right tone is simply one that serves the song. Get creative and don't be afraid to experiment. You'll get it wrong sometimes, but I'm pretty sure God won't hold it against you. Below I've included some lessons that get especially detailed in the tone chapter. "White Flag" goes into that dotted eigth note delay everyone seems so keen on nowadays and "Great Are You Lord" talks ambient work as part of the lesson. You can also try some songs in our "Riffing Through The Reverb" lessons to play with your more effect-oriented parts. Looking for ways to use effects in worship? Check out our Tone Talk category for all things gear. As always, I'd love to hear your thoughts so jump into the comment section below. Jason - I joined the website three weeks ago when our lead player was out for a month. Your site helped me tremendously. Thank you so much for sharing your passion not only musically but also as a reminder that we are leading worship not PERFORMING worship. Just look at the congregation when the music is playing; people love to worship with these songs, we are accompanying them in musical prayer to the Lord. 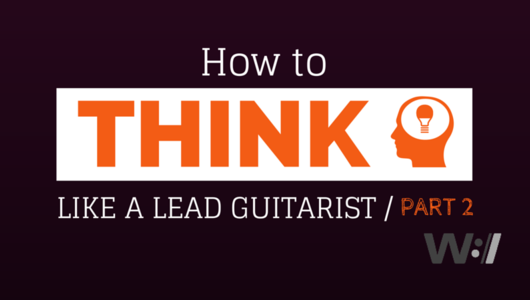 I loved these videos on "How to think like a Lead Guitarist." Specific to tone, I use a Line 6 HD500, so when talking tone, could you show a picture or your settings. I think it would help others that don't have that specific pedal but have something similar to it. I do agree that I tend to lean to more distortion so I always dial my drive in the bedroom to where I think it should be and then bring it back 25%. Too clean is always preferable to too distorted.